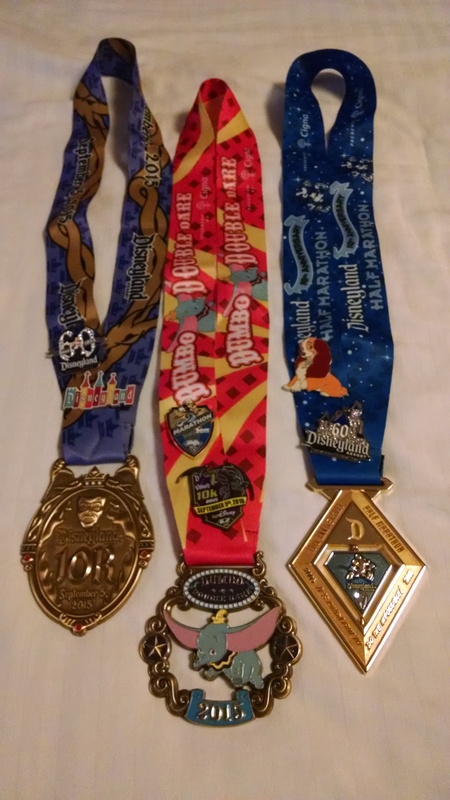 This year’s race weekend, as you might expect will include runDisney Kids Races, a 5k, a 10k, the half marathon, and the Dumbo Double Dare (for those who registered for the challenge to run both the 10k and half marathon). Some Quick Changes & Tips For This Race Weekend. 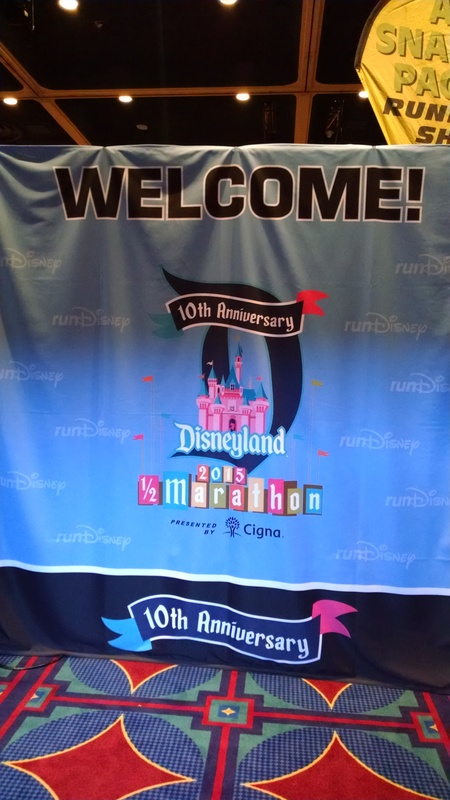 1) runDisney will NOT be offering a printed event guide, choosing to make it only available online. You can find the electronic event guide here. I am not a fan of this for two reasons. First, many runners value the event guide as a souvenir of this event. Giving the high cost of these races, eliminating this benefit just seems silly. Second, from a practical matter, when you are travelling, it is nice to be able to thumb through the paper version of the guide in your hotel room and make note of important times, locations, and other information. Hopefully runners will not miss out on important information given this change. 2) All events other than the Kids races begin on Disneyland Drive between Magic Way and Paradise Way, near Disneyland Hotel and the Lilo Parking Lot near Downtown Disney. The finish lines will be nearby. This is near where the expo will be held so you can plan your race morning route when you go to the expo. 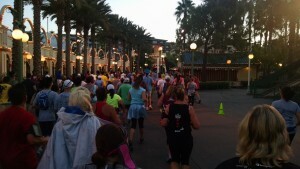 3) Transportation: If you are used to Walt Disney World Resort runDisney events, Disneyland events are VERY different. Once you are near the Resort, everything is within walking distance, including many off-property hotels. If you want to save your feet, free transportation is provided via Anaheim Resort Transportation (check out page 6 of the event guide for more details). For most people, walking or Uber will be your best option. If you are driving, there are lots of road closures and race days can be messy for traffic, so leave plenty of time and plan your route in advance. 4) Start Times: Aside from the Kids Races, all 3 events start at the same time: 5:29 a.m. for the Wheelchair Start with runners starting at 530 a.m. Runners need to leave enough time to be in their corrals well in advance of these start times. 5) Safety Tip! I learned from experience that the lane markers on the Anaheim streets can be tricky to navigate, especially when they are wet. They are a hard plastic and can become very slippery if you are not paying attention. So, do yourself a favor and pay attention to these when you are running down the streets. 6) Pictures! Pictures! Pictures! Race photos are once again being included in your Disney Photopass package. So, if you are on the fence about whether to buy it, you may want to look into it. 7) Plan Your Route! 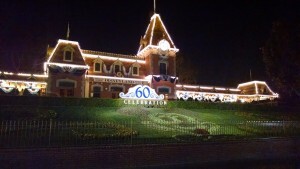 If you are staying east of Disneyland, you can walk to the races via the Esplanade. However, after the 5k and 10k, if you plan on returning to your hotel this way, you may have difficulty. 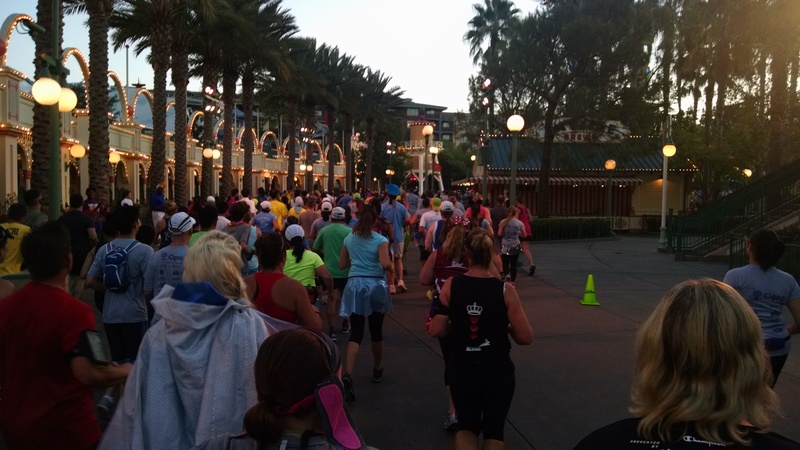 In past years, if the race is still going on, they closed pedestrian access in Downtown Disney and we were stuck for a good 45 minutes, until all runners finished. So you may want to opt for a different, longer route back to your hotel, especially if you want to get cleaned up before hitting the parks. 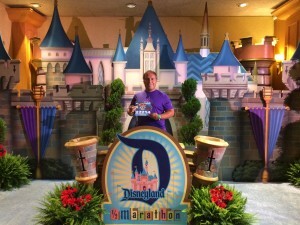 While we have an entire article with tips for Surviving a RunDisney expo, I wanted to share some Disneyland-specific ones. The Expo begins on Thursday morning and goes thru early Saturday evening at the Disneyland Hotel Exhibit Hall. From past experience, runDisney expos tend to be the most busy on the first day of the expo (especially when the expo first opens). However if you want official race merchandise I suggest that you make it to the expo on the first day, preferably at opening. They have been doing a good job of restocking some of the event merch at recent events, but you never know. Also, another tip for getting official race merchandise is to go to the merchandise booth before you go to pick up your bib. Your bib will be there no matter when you go, the merchandise may not. The only people that absolutely have to go to the expo on Thursday are the 5K runners. That being said, all 10K and Dumbo Double Dare Challenge runners have to go to the expo before it closes on Friday. Because of this, Saturday will have the lowest crowd levels because the only people left to pick up bibs that day are the remaining half marathon runners. 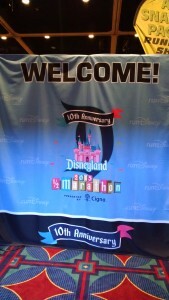 Tip: Don’t leave without checking out the photo ops runDisney sets up. They are usually worth the wait. 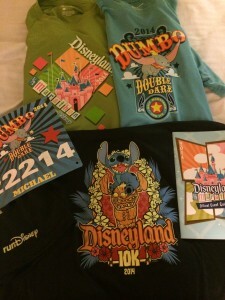 Make sure to check out more tips on Surviving a RunDisney expo. New Balance & Special runDisney Running Shoes. Many runners say, aside from nabbing some event merch, say their top priority at every runDisney expo is to head on over to the New Balance booth so they can grab the awesome runDisney-themed shoes. If you want to get your hands on these shoes you need to sign up for a virtual spot in line the day before you go. I always head to check in and collect points on the MyNB app. If you are not familiar with this program you can collect points on the app to get rewards such as, runDisney race bibs! (Yes this is amazing, go ahead go sign up…just don’t forget to come back and finish reading this article!). Now, lets get to the races! This course is pretty straightforward. You start out heading south on Disneyland Drive, before making a left turn into the backstage area of California Adventure. You will find yourself just south of Paradise Pier before entering onstage in CarsLand. TIP: Keep an eye out to your right for a gorgeous view of the mountains, and then to your left for the neon lights of Radiator Springs. 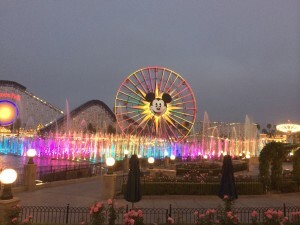 You’ll make a gradual left turn where you will find the Mile 1 marker and then be treated to a gorgeous view of World of Color, so get your cameras ready. A right turn takes you around Grizzly Peak and past Soarin and the Carthay Circle Theater en route to the Hyperior Theater. A right turn takes you past the Tower of Terror and then a left exit backstage. You will be heading north and pass UNDER the Esplanade. This is the only real elevation of the course, and its a fun feature. On the other end you will find the mile 2 marker and a backstage entrance into Tomorrowland near Space Mountain. You will make your way past the Finding Nemo Submarine Lagoon and the Matterhorn on your way to Fantasyland. A quick left turn past the carousel brings you to the spectacular run INSIDE Sleeping Beauty’s Castle and your stroll down Main Street USA (heading south) to the main exit of the park. You will exit onto the Esplanade and turn right, heading towards Downtown Disney. After you cross over Disneyland Drive you will encounter the 3 mile marker then a quick .1 mile long chute right into the finish line. You start out heading south on Disneyland Drive and keep heading south for nearly a mile (yes you are heading away from the parks, sorry). You will make a left turn just before the 1 mile mark and then start making your way around the Anaheim Convention Center. I actually enjoy this part of the course: it is well-lit and wide open so it gives crowds a chance to thin out a bit. Once on Harbor Boulevard you turn left and head north, entering the backstage area of California Adventure from the East just before the 2 mile mark. You will make your way backstage behind CarsLand, following roughly the same route as the 5k (see above). This big difference is you get to run ALL THE WAY AROUND World of Color. Enjoy this as it is a true highlight of any runDisney race. You will pass the mile 3 mark just after Toy Story. A left turn takes you around Grizzly Peak and past Soarin and the Carthay Circle Theater en route to the Hyperior Theater. A right turn will takes you past the Tower of Terror and then a left exit backstage. You will be heading north and pass UNDER the esplanade just after the mile 4 marker. This is the only real elevation of the course and it makes for a fun feature. You will be backstage to the east of Tomorrowland for a while as you pass the roundhouse (that houses the Disneyland Steam Trains and Monorail) and the support buildings for the horses and parade units. Enjoy this time as few park guests ever get to see it. You will enter the Disneyland Park in Toontown and make your way into Fantasyland, then past the mile 5 mark before encountering the Matterhorn, the Finding Nemo Submarines, and Space Mountain. Next you reenter Fantasyland so you can run past the Carousel and into Sleeping Beauty’s Castle, where you will emerge onto the main Hub. Enjoy this moment before you stroll down Main Street USA (heading south) to the main exit of the park. NOTE, if you ran this race in the past, this is where the course is different from past years as you will not be running in Frontierland or past the Rivers of America. You will exit onto the Esplanade and turn right, heading towards Downtown Disney. 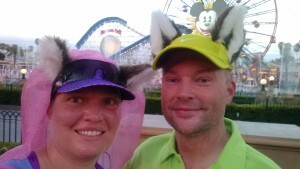 The mile 6 mark is just before you cross over Disneyland Drive and then it is a short .2 miles to the finish line. 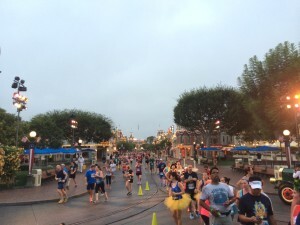 First, you should know that only the first 4 miles of this race are in the parks. Second, these 4 miles are a mix of the 5k and 10k courses. You start out heading south on Disneyland Drive, before making a left turn into the backstage area of California Adventure. You will find yourself just south of Paradise Pier before entering onstage in CarsLand. TIP: Keep an eye out to your right for a gorgeous view of the mountains, and then to your left for the neon lights of Radiator Springs. You’ll make a gradual left turn where you will find the Mile 1 marker and then be treated to a gorgeous view of World of Color, so get your cameras ready. Like the 10k, you will run all the way around World of Color. Enjoy this as it is an improvement to the Half Marathon Course (I personally think World of Color is THE highlight of this race). A left turn takes you around Grizzly Peak and past Soarin and the Carthay Circle Theater en route to the Hyperion Theater. A right turn will takes you past the Tower of Terror and then a left exit backstage. You will head north towards Disneyland to an entry onstage in Tomorrowland, before making your way around Fantasyland, into Sleeping Beauty’s Castle, and right down Main Street USA. Inside the park you will pass mile markers 2 and 3 and exit out the Esplanade, where you will turn left and head east towards Harbor Boulevard. You will turn left (north) before reach Harbor and follow a similar backstage route as in the 10k. You will pass the mile 4 marker shortly for exiting Disney property. At this point, I could tell you about all the turns, but you really don’t care. Keep an eye out for marching bands (I LOVE marching bands!) 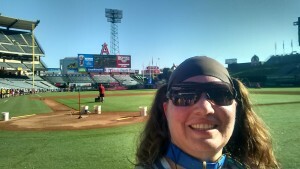 as you will not reach the Honda Center (home of the Anaheim Ducks) until just after the mile 8 mark. After passing the Arena you will turn onto the Santa Ana River Trail (in past years this stretch has been VERY dusty, so be prepared if conditions are dry). If you see a giant red letter A, you know you are about to turn off the trail and into the parking lot of the home of the Anaheim Angels. A quick jaunt through the stadium is always a fun highlight of this race. Watch your footing entering and exiting the baseball stadium, and be sure to wave to the assembled fans and soak in the fun atmosphere…you may even hear them announce your name. Once you exit the stadium, you will find the mile 10 marker. I wish I could tell you that this next stretch is exciting, but…yeah…just keep telling yourself that you only have a 5k to go! You will be heading west on your return to the Disneyland resort, and when you see Harbor Boulevard again, you know you are almost home free. Just after Harbor, you re-enter the backstage area of California Adventure via the same entrance you did earlier in the race. There you will find the mile 12 mark. Again, for reference, at this point you will be just south of CarsLand and then California Screamin and Paradise Pier. You will not go back to into the parks, instead you cross over Disneyland Drive before turning right and making your way north towards the finish line. After crossing the finish line make sure you collect your medal! A first-aid tent is available if needed, if not, its time to collect your goodies. You’ll get your water and Powerade. And it is also time to stop for a finisher photo! It is important that if you earned your Dumbo Double Dare Challenge or Coast to Coast medal you head through the appropriate line or tent to do so. Volunteers will verify your bib with the photo you took at the expo for the Dumbo Double Dare Challenge or your wristband for the Coast to Coast medal. Next, make sure you pick up your banana and runDisney snack pack. You have officially made your way through the finish line at this point and it is time to spend time with your family and friends or hurry back to your hotel to shower and spend times in the park! Don’t forget if you’re going out to the park to celebrate wear your medal(s)! Good luck Casual Runners! We hope you all have a magical race weekend at the Happiest Place on Earth!